Cycle time reduction of information availability, executing transactions and realization leading to informed decisions. Reduces Cycle time of the processing, information gathering and negotiation cycle etc. Capable of electronic communications internally (inter department) as well as externally (vendors and buyers)-minimizing paper transactions. Alerts & Alarms, Works as an assistant having a well defined task to do with outstanding and overdue jobs reduced staffing levels. Fast communication at very economical cost extendable to a web based solution to have global Access with real time information round the clock (24x7). Respectively lower cost of implementation. Flexible in terms of ease of Customization and Scalable in terms of efficiency and effectiveness. Entry level server class machine with 512MB RAM. 40GB HDD, and backup option. 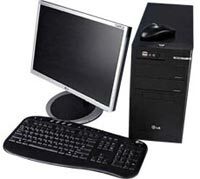 Client Entry level machine with 128MB RAM,40GB HDD, Windows2000+, Word processor. Network Switch based Ethernet LAN setup Internet connectivity on at least one machine. Other Printer Dot matrix, Laser Jet on network as per the requirement and usage.